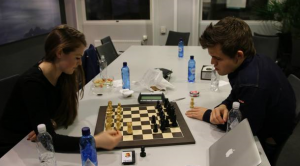 In October Classical Chess World Champion Magnus Carlsen defended his World Rapid (30 minutes per player) title in Berlin. In between tournaments and matches he has initiated a business venture that aims to widen interest in the royal game. The business side of chess is where the Canadian connection comes into play. There is a very interesting article in The Globe and Mail that says it all. Very cool! Isle of Lewis Chess Pieces – Medium Size!